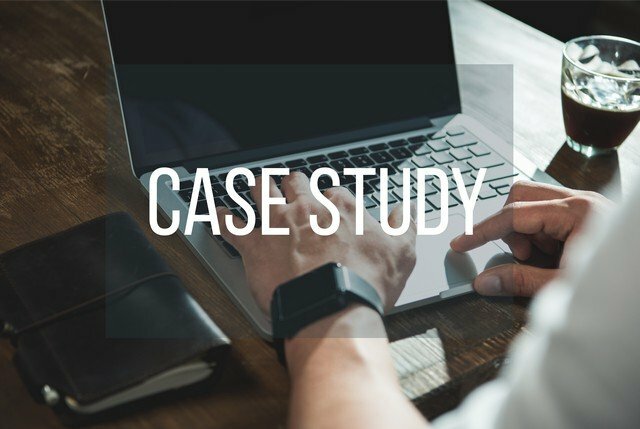 Digital Marketing Success: Case Study! Since 2015, I have continued to offer digital marketing services to restoration contractors throughout the United States. When I first started this business, I knew that a digital marketing strategy is effective if it is well thought through and implementation is executed consistently. From 2011 to 2014, I worked exclusively for a disaster restoration company, starting initially in a marketing and business development role and eventually moved into the position of Chief Financial Officer. These were great learning years where I gained a complete understanding of how a restoration company operates from a marketing and lead generation stand point as well as the complexities of operations and financing. This experience is the primary reason my strategy generates results for my clients. I understand the restoration business and the questions consumers have about the services they offer. This understanding enables me to anticipate and answer questions through the content I post on my clients’ websites. In turn, this creates goodwill and trust between the consumer and restoration client, which leads to higher close ratios. My passion for this business really grew from the desire to educate consumers. In 2007, I suffered from mold illness after purchasing a building after the inspector indicated it had moisture concerns. There was water damage in the ceiling from a leaky roof, window casings were rotten, and the integrity of the building structure was questionable as the walls moved noticeably when pushed. Like most people, I really did not pay much attention to the damage and after fixing the leaks, continued to work. Unaware of the presence of mold and its impact on health, my family and I grew increasingly sick for the next three years. I still remember how difficult it was to accomplish anything during this period. I suffered from bronchitis and pneumonia several times, always felt tired, could barely concentrate, and really became depressed. In 2010, we moved after selling the business and the building and I began to feel better. Full recovery took 12 months. In 2011, I started a consulting business focusing on helping business owners grow. Luckily, one of my past business associates who owned a disaster restoration company presented an opportunity to work with him. My first task was to begin working on creating an online following for his business, managing his social media and website content. I was also required to educate consumers on the topics of mold, asbestos, indoor air quality, water damage, etc. I really enjoyed this work because I was learning so much from the research, but most importantly, helping other consumers educate themselves. After gaining considerable experience in the field, fast forward to 2015 when I decided to launch my digital marketing agency and offer my content marketing and digital marketing services to other restoration contractors. The rest as you say is history. First, I will provide you with data clearly demonstrating you can gain a significant return from investing in a digital marketing strategy. Second, I will detail why your website is so important in converting visits to leads and how you can maximize conversions with 16 website recommendations. Third, I will present the top 10 skills you need to have to implement a successful digital marketing plan. Since March 2016, one of my clients has generated 100,000 plus page views mostly from visitors referred by search engines and FaceBook. Implementing my strategy, traffic to their website has grown approximately 50% each year: 20,960 page views in 2016; 30,660 page views in 2017; and 43,557 page views in 2018. Most of the visitors to the site originate from Facebook through B2C (Business to Consumer) PPC (Pay Per Click) ads and organic search engine visits. In 2018, this client spent $24,000 (including the advertising budget for PPC ads) on RDMS’s services and generated 340 web leads from consumers filling in an online form. This does not include additional direct phone calls to the client, which are in addition to online inquiries. However, for the purposes of this article, we will focus on leads captured from direct inquiries online through the website. I spoke with the client and they advised me that the average closure rate on leads is 40% and their average sale ranged from $3,000 to $6,000. Based on this data, this means they closed 136 leads (40% of 340) generating sales between $408,000 (136 jobs x $3,000 per job) and $816,000 (136 jobs x $6,000 per job). Simply put, for every $1 spent on RDMS’s digital marketing services, the client generated between $17 and $34 in revenue. This is an excellent return on investment! Top 5 Reasons The Client Got An Excellent Return On Investment! When I started working with this client, I explained this approach is a long-term strategy. All good marketing takes patience because it takes at least 7 touch points, ie. exposures to their brand, likely more, when you are focusing on creating online relationships with potential consumers. RDMS’s strategy focuses on posting high quality content on the client’s website. You likely have heard “Content Is King“, but this is only true if the quality of the content is sincerely written to provide value to the reader. The main purpose of the article is to create awareness and educate. It is posted to generate a positive reaction and hopefully lead to what I call “digital word of mouth” where the reader decides to share the article with their friends and family on their social media profiles. The success of any digital marketing effort is based exclusively on consistency. This is the guiding principal for all marketing. To have a deep and strong impact, the campaign must be scheduled and implemented consistently. Consistency develops trust and trust increases successful lead acquisition and sales. It creates significant brand awareness of the client’s company and their Facebook page, which leads to a higher fan base. The ads target consumers in the client’s service area, meaning they are seeing the ads locally on their Facebook timeline. Keep in mind, these are not “salesy” ads. They are designed to peak the viewers interest and compel them to want to learn more about the topic. I focus on Facebook because the cost per click is significantly less than Google ads. Included in the digital marketing contracts I sign with my clients is management of their social media, meaning their FaceBook fan page is consistently updated. Comments and notifications are monitored continuously and if a comment or question is posted that requires the input of the client, I will let them know so they can respond personally. The impact of owner engagement is significant because it demonstrates caring which leads to further trust amongst fans of their business. This results in an increase of customer referrals, sharing, and goodwill from consumers in their service area. Most importantly, this client has generated such great results from their investment because of the quality of their website – as provided by RDMS. There is absolutely no point investing in a digital marketing campaign if your website is not designed professionally. With this in mind, the next section lists my top 16 website recommendations. 16 Website Recommendations To Increase Lead Conversions! The success of your digital marketing strategy will be accelerated if you have a well laid out, professionally designed website as the foundation for all future efforts. Make sure your menu is designed so visitors can navigate the site easily. Create your website using WordPress. I recommend WordPress because it is a very effective tool for inbound marketing/blogging/content marketing and provides you with many different plugins that you can use to enhance SEO efforts, stats, list building, sharing, etc. More importantly, WordPress is very easy to use. Once your website is successfully getting lots of traffic, you can likely manage this yourself or appoint a staff member to do so! 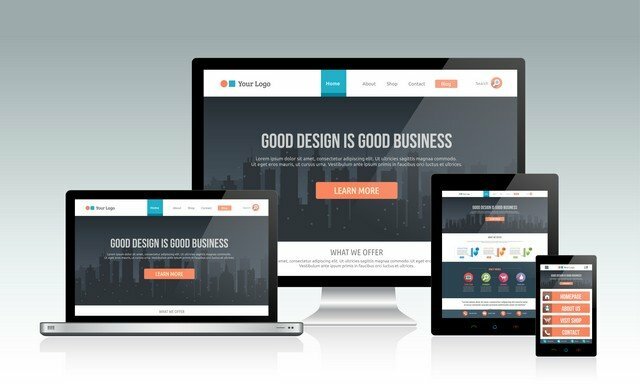 Ensure your website is built using responsive design so that it looks good on multiple devices (mobile, tablets, desktop, etc). 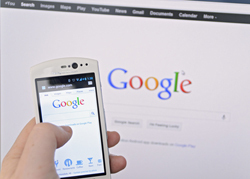 Implement AMP (accelerated mobile pages) so Google can serve up mobile pages to your viewers. Spend time on the “About Us” section of your website. You want to create trust, which is conveyed best through staff pictures, bios, personal and company history, etc. Make sure the SEO of your pages is set up properly with title tags, header tags, meta descriptions, etc. Optimize images and make sure that they have alt tag descriptions. Make sure the “Contact Us” page is easy to find and has all of your business details (address, etc). Ensure that your visitors can easily share your pages and posts. Be social! Your website should have links to the social media you use including Facebook, Twitter, and LinkedIn. I also recommend that you claim your Google Business page and go through the steps to verify the page. Make sure your website has a site map so it is easier for search engines to index it. Get testimonials – written and video if you can. Ensure that you have a separate section devoted to this. If you offer a guarantee, make sure this is visible on your website. Ensure your phone number is visible at the top of each page. Publish before and after photos of your work. Finally, offer a newsletter or some type of free report or something to prompt visitors to your website to subscribe to your newsletter and create an e-mail list that you can market to. I offer a digital marketing course to contractors that want to educate themselves and implement their own digital marketing strategy in-house. There is no cost to the course. That said, in my experience most contractors that start their own digital marketing campaign find it difficult to maintain primarily because they get so busy managing their businesses. If you plan to implement a digital marketing campaign and hire in-house, the next section will list and explain all of the skills that you should be looking for in a potential employee. Top Ten Skills Required To Be Successful At Digital Marketing! Research and writing skills. 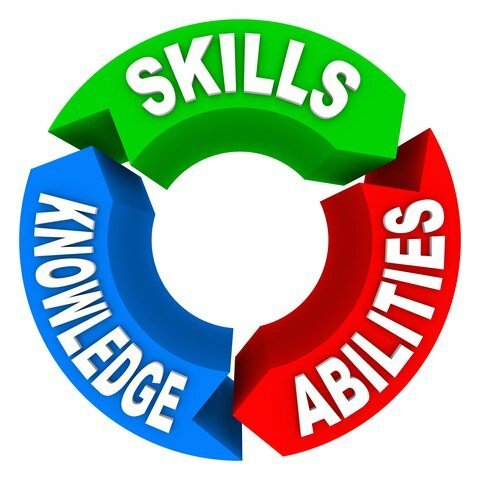 By far one of the most important skills. Note: 300 or 400 word articles will likely be of little benefit. Aim for articles with 1,000 words or more. Marketing or communications background which is essential for creating copy to create calls for action and enticing ads on Facebook. This draws consumers in and encourages them to read and share the content. Ability to curate content from news sources so that your social media profiles (Twitter, Facebook, LinkedIn, etc.) are consistently posting information to keep your fans engaged and following you. Basic knowledge of html and working knowledge of WordPress including the many plugins that can be used to enhance your website look and feel. Basic knowledge of Google analytics and Google webmaster tools. Knowledge of Bing is beneficial as well. Page and Post SEO skills to ensure the candidate is not only able to research and write effectively but is able to set up the content properly on your website with proper title tags, meta descriptions, etc. Getting this right is critical for long term success. Ability to use SEO plugins like All In One SEO or Yoast SEO. Ability to source and implement images effectively into blog posts, meaning they should be resized to load quickly and have proper alt tags for SEO purposes. Discipline and organizational skills. Content marketing only works if it is done consistently. Plan to post and promote a minimum of 2 articles per month or 48 to 60 articles in a period of 24 months. Working knowledge of social media, most importantly Facebook, Twitter, LinkedIn, and Google Plus. The individual you hire should know how to post articles, schedule posts, share information, and understand how to manage your profiles effectively and consistently. Note: if planning to hire someone for this, expect to budget between $30,000 and $60,000 annual salary expense plus advertising costs. According to PayScale, the average salary of a digital marketing specialist is around $58,000 per year. In addition, you should forecast your budget for a minimum of 24 months to yield any results from this. Keep in mind, hiring in house may cost significantly more than hiring an outside agency. If you decide to work with an agency, make sure they are familiar with the restoration industry, work with multiple clients, and have significant expertise. Request A Digital Marketing Proposal! RDMS offers you 6 key benefits of leaving your digital marketing needs to us. We work in the background, managing all of your digital marketing while you focus on managing and operating your business. The proposal process starts with a 60 minute free consultation which you can book online. The purpose of the free consultation is to find out more about your business, your current digital marketing, and find out about your lead generation goals. Blogging Is A Game Changer! 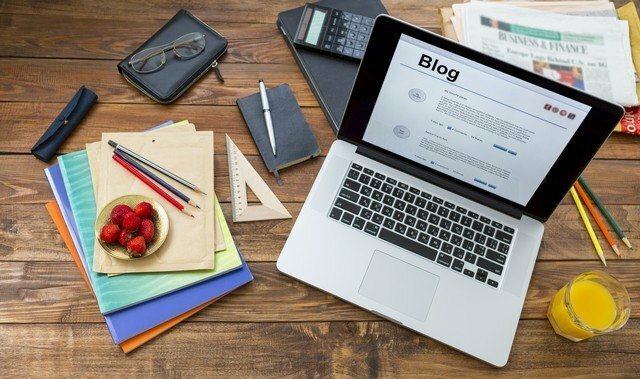 : Blogging is a game changer for the disaster restoration industry because it empowers contractors to connect with consumers early on in the sales cycle. 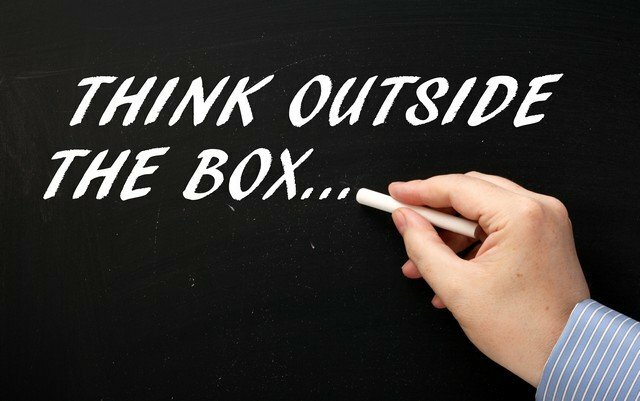 This article explains why contractors that think outside the box can gain more leads and sales by investing in an inbound marketing strategy. Top 7 Content Marketing Statistics: This article explains why digital marketing works by answering the top 5 questions most often asked by disaster restoration contractors. In addition, we list and explain the top 7 statistics that show you why content marketing can be such an effective strategy at increasing your leads and sales. Top 4 Goals Of Content Marketing! : Many disaster restoration contractors set up blogs and wonder why they do not work. The purpose of this article is two-fold. First, it highlights the top 4 strategic goals of content marketing. Second, it explains why “content is king” but “consistency is queen.” Consistency is the key to success! Google Is No Longer The Referral King! : Did You Know That Facebook Refers More Traffic To Websites Than Google? In fact, 60% of all the traffic to websites today related to education and research originates from Facebook, compared to only about 20% from Google. This article explains how to maximize your ROI from a Facebook marketing strategy! If You Want More Leads, Read This! : If you want to create a long term organic lead referral system, this article will explain how you can generate more leads with a content marketing strategy promoted through PPC ads on Facebook. The Business Case for Content Marketing: An article published by R and R magazine, explaining why your business needs to have a digital marketing strategy. 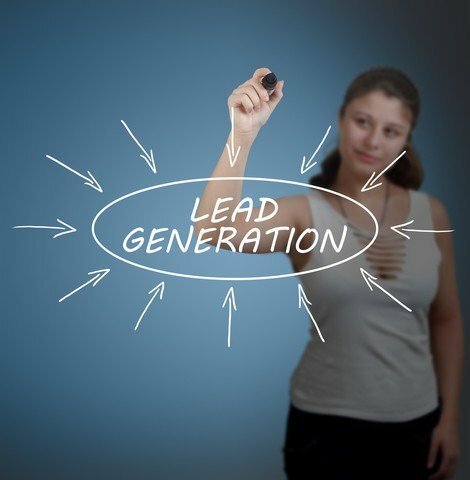 If You Want More Leads, Read This! I am a strong proponent of content marketing because I know that it works, particularly for disaster restoration contractors that offer water damage restoration, mold services, asbestos testing and abatement, and fire restoration. One of the key parts of my strategy for building awareness of the content is pay per click advertising. Increased lead acquisition that should generate sales and revenue for your business. In a previous article, I outlined why FaceBook is one of the best social media services that you can use to build awareness of your content and your brand. 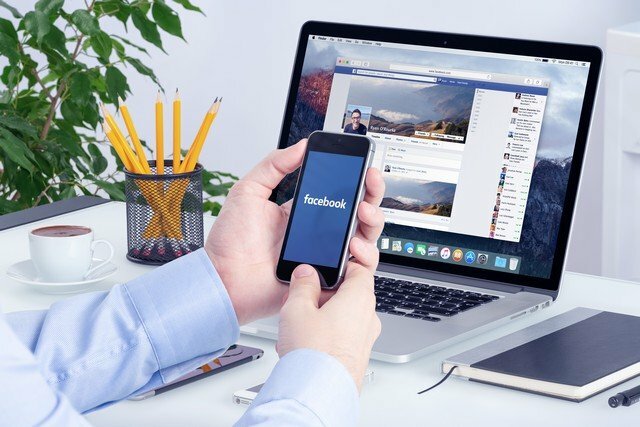 In this article, I will provide you with statistical data from an actual FaceBook campaign and also provide you with information from third party sources that demonstrate that FaceBook is one of the least expensive platforms that you can use to build brand awareness, brand enthusiasts/fans, digital word of mouth, relationships, trust, awesome leads, and most importantly sales. Don’t Buy Into The Negative FaceBook Hype! 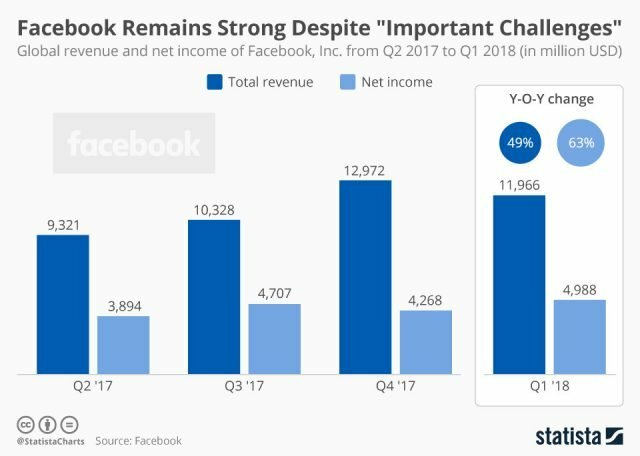 Despite the Cambridge Analytica scandal still swirling around Facebook, resulting in a grilling at the hands of the U.S. Congress for CEO Mark Zuckerberg and the spurring on of the #DeleteFacebook movement, the company recorded strong quarterly figures for Q1 this year – including user growth. The chart below, courtesy of Statista, clearly demonstrates that marketers continue to use the platform because of the high value it delivers. If you are still concerned about some of the negative hype you are reading about FaceBook, I encourage you to review these articles first before passing judgement! Facebook explains why it needs your personal info outlines how data is used. It is used to increase the effectiveness for marketers. Social Media Demographics to Inform a Better Segmentation Strategy is an article you should definitely review because it provides you with demographic data on FaceBook users. What you will learn is that your customers are on FaceBook! How Much Are You Currently Spending Per Click To Drive Traffic To Your Website? Many contractors still rely on Google Adwords to send traffic to their websites. Fair enough, but I encourage you to analyze the cost per click you are paying. If you are paying for clicks on Google, you will pay an average of $1 to $2 per click and MUCH more if you are in an area where there are many competitors because Google AdWords is based on an auction system. Keep in mind, just because you get a visitor to your website, does not mean that they will convert into a lead. Is the higher cost to acquire a visitor to your website worth it? One of the core benefits of content marketing is that it leads to long term organic search engine referrals to your website. Sure, there is an investment in building the content, but this investment will deliver long term ROI because once a high quality article is posted on your website, it will also get listed by Google. One of Google’s goals is to refer visitors to the best listings from a search, so if you focus on delivering excellent and valuable content you will be rewarded. Bottom line, if your primary strategy is Google Adwords, then you will always need to rely on this strategy to push traffic to your website. 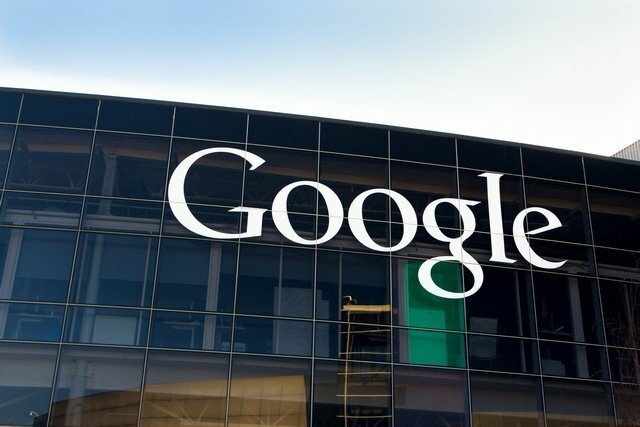 When you stop spending dollars on Google, the traffic will stop! But, if you adopt a content marketing strategy and commit to it for 24 months, you will have enough content on your website and will have driven enough visitors to your website that you will begin to receive more organic search engine referrals. A two year investment will lead to a constant stream of traffic, particularly if you commit to posting 48 to 60 articles during this 24 month period. 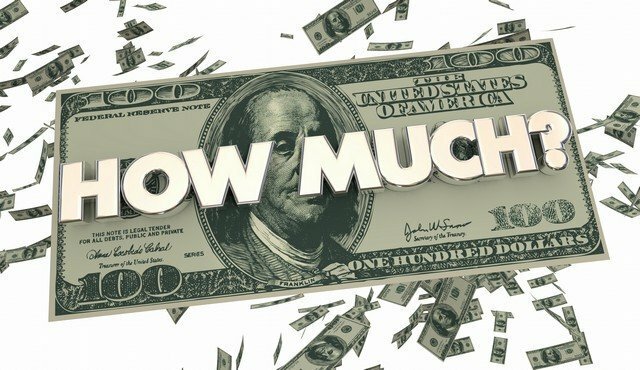 Cost Per Click Of 18 Cents Is Possible! In January, 2016, I was contacted by a contractor who was not getting the results he expected from the SEO agency he was working with. He was spending about $2,000 per month on Google Adwords and just was not getting the lead acquisition he expected. When he contacted me, I told him that I am not a strong proponent of this marketing method because it is not a long term strategy. Instead, I explained why I believed that content marketing was the best long term business play for him because it would create sustainable, long term visitor traffic to his website. Long story short, he decided to work with me. More than 2 years later, I am still working with this client and he is spending much less than $2,000 per month and getting much better results. The screen shot above is an example of a campaign I launched for him. As the screen shot shows, for a spend of $81.62 it has resulted in 446 direct clicks to my clients website, averaging about $0.18 per click. Based on statistical data for the past two years, I know that the average cost per click is $0.50. That said, there are certain articles that resonate with consumers more and they respond by increasing the number of shares and visiting the site. The ultimate benefit is the cost per click decreases dramatically. The screen shot shows that a spend of $81.62 has resulted in 446 visitors to the website. Since I have budgeted $200 for this campaign, I anticipate that this spend will result in more than 1,000 visitors to the website. This is a great return on the advertising investment! There are two other statistics that FaceBook Insights provides that you should be aware of. The first is the number of people your campaign is reaching. The more you budget, the more people will be exposed to your ad. My goal when I post a campaign is to maximize the reach and clicks to my clients website. The screen shot above shows you that I reached over 6,000 people with an ad spend of $81.62. This is pretty significant because about 8% of these people clicked on the link and read the article! The other key statistic that FaceBook Insights provides is post engagement, which tells you how many people are engaging the post on your FaceBook page. 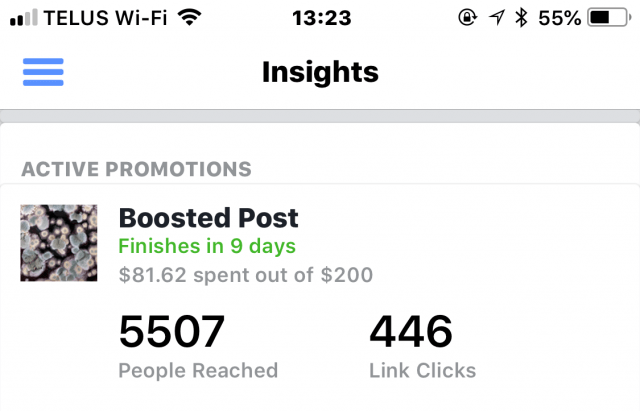 As the screen shot above shows, this campaign resulted in a dramatic increase in engagement which means more people are gaining awareness of your brand. Brand awareness is important because it leads to “Top Of Mind” awareness which is one of the key goals of any marketing. You want consumers to think of your company when they are faced with a restoration concern like a flooded basement, kitchen fire, mold and or asbestos concern, etc. Ultimate Goal Of Content Marketing! The goal of content marketing is to expose your brand, message, and services to more consumers in your service area. You can do this by driving more visitors to your website. The value of these visitors grows over time as the brand recognition grows. You will definitely increase conversion rates, ie. inquiries through phone or an online form, if your website is laid out properly. In fact, in the free course I offer, lesson 6 provides you with 16 tips to maximize the response you get from website visitors. Maximize the response and you will increase leads and sales! The statistics from the screen shots clearly demonstrate that good content distributed through paid advertising on FaceBook will definitely increase the number of visitors to your website in your service area. Done consistently, this approach will increase trust in your brand, which in turn generates more leads that turn into sales. To date, I have written extensively about the benefits of content marketing. In fact, R and R Magazine, recently published an article, “The Business Case For Content Marketing” that you may want to review. Google Is No Longer The Referral King! Sanjay is a marketing professional with over 20 years of experience in both traditional marketing and digital marketing. His digital marketing agency specializes in helping disaster restoration professionals increase their brand awareness and online lead generation using content marketing on topics related to mold removal, asbestos abatement, water damage restoration, fire and smoke restoration, and bio-hazard. 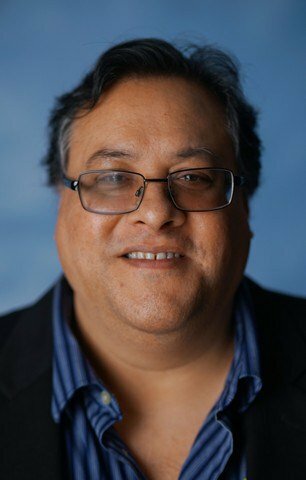 In addition to providing marketing services to several restoration contractors, Sanjay is also the CEO of CitriFresh Distribution, a chemical distribution company that helps disaster restoration contractors increase their profits and also offers coaching and consulting services. This article will explain why you need to consider investing more in your FaceBook marketing strategy. Specifically, I will cite statistics that show you that for every $1 invested in FaceBook you will generate a much higher return than Google! Did You Know That FaceBook Refers More Traffic To Websites Than Google? According to Business Insider, Statista, and Parse.Ly, the biggest sources of traffic to websites today are Google and FaceBook, accounting for 80% of all web traffic. Simply put, if you are in business and want to get referral traffic, you need to understand how to maximize your traffic from Google and FaceBook. Most contractors I interact with are more concerned about getting traffic from Google. I understand. However, did you know that FaceBook refers more Education & Research traffic than Google? In fact, 60% of all the traffic to websites today related to education and research originates from FaceBook, compared to only about 20% from Google. In an earlier article, I explained why disaster restoration contractors should pursue a content marketing strategy. The statistics show that you will get more traffic, higher search engine rankings, and most importantly, more leads that convert to sales. An educated consumer will make better decisions. Contractors that position themselves as the expert in their area will gain more leads and sales because they are offering highly valuable information to potential customers. In addition to researching brands, products, health issues, and other lifestyle topics, consumers today use social media to get news, education, recommendations, and referrals on service providers and products. The largest social media platform consumers use for this is FaceBook. If you are pursuing a content marketing strategy and want to maximize the return on your content, this article will explain why you need to consider investing more in your FaceBook marketing strategy. Specifically, I cite statistics that show you that for every $1 invested in FaceBook you will generate a much higher return than Google! The Business Case For FaceBook! 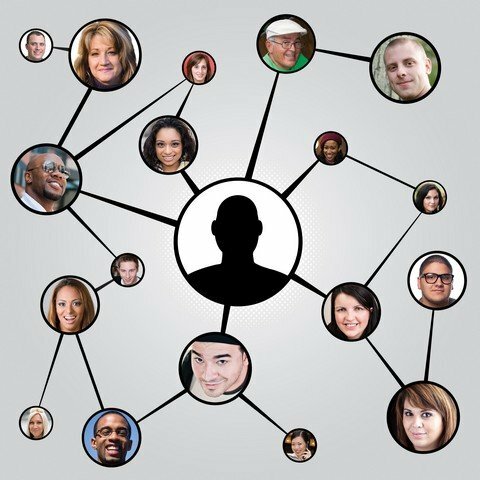 FaceBook is a large source of referral traffic. In fact, according to Business Insider, FaceBook refers 40% of all the traffic to websites on the Internet. Nearly 2 billion users on FaceBook. It is the largest social media in the world and where your customers are checking in daily. Finally, the relative investment in FaceBook ads pales in comparison to bidding for ads on Google or investments in other traditional advertising. Since 2015, I have been sending traffic to my clients’ websites using FaceBook ads targeted to consumers in their service areas. On average, for every dollar I invest for my clients, they get 2 visitors to their websites. Compare the cost of FaceBook to Google Ads where you are paying for clicks and bidding for key words amongst many other contractors in your area. The average cost per website visit for my clients that use FaceBook ads is $0.50. In contrast, if you are paying for clicks on Google, you will pay an average of $1 to $2 per click and likely more if you are in an area where there are many competitors because Google AdWords is based on an auction system. Another consideration is that many contractors rely on SEO agencies to manage their adwords campaigns. Do your homework and find out how many of your competitors the same SEO firm is working with in your area. If you are working with a firm that is managing the adword campaigns for you and your competitors in your service area, you will likely be paying a lot more per click. FaceBook Empowers You To Build Relationships and Digital Word of Mouth! There are two other reasons that you should consider using FaceBook. First, if you post your content to your FaceBook fanpage, you have the opportunity to create fans for your business and brand, meaning you can determine who likes your page and reach out to them personally. This empowers you to begin building a fan base that will be able to interact with your brand on your fan page by commenting on articles, reading posts, providing testimonials on your services, etc. Second, if you post an article that fans or consumers in your service area like, you can leverage what I refer to as “digital word of mouth” which leads to social sharing. When someone shares your article to their timeline, you are leveraging the value of the ad spend, meaning you will multiply the number of visitors you receive to your website at no additional cost. For instance, let’s say someone shares the article to their profile and they have 250 friends. If 3 of their friends click on the article and read the article, your average cost for post share reduces even further. The more people that click on the link and view the article, the less the post share is costing you. Some campaigns I have launched for clients have resulted in over 1,000 shares. Concluding Thoughts: More Traffic, Higher Brand Awareness, More Pages For Google To Index, More Leads, More Sales! 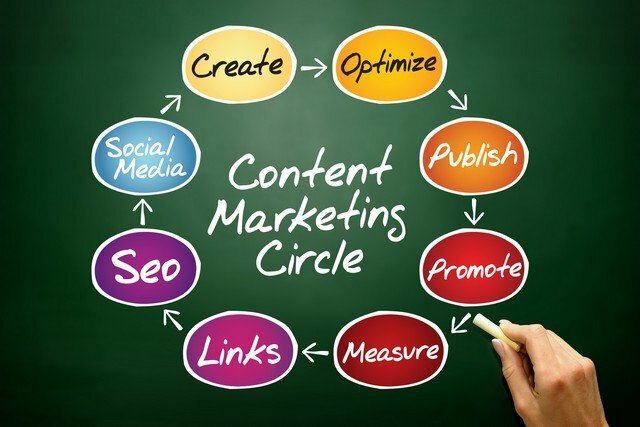 A well thought out and implemented content marketing strategy will accomplish several goals. First, it will increase the number of visitors to your website, visitors that could eventually call on you during an emergency situation or inquire about indoor air quality concerns caused by mold or other issues. Second, by educating consumers in your service area, you are actually providing a service by informing and creating awareness. This is one of the first steps in creating a relationship early on in the sales cycle and the premise to begin building TRUST, the prerequisite to getting an inquiry that leads to a sale. Third, consistently posting content on your website, promoted through a targeted campaign on FaceBook, will expose your content and brand to more consumers in your area through direct clicks and social sharing, which in turn increases your opportunities for higher lead acquisition. Fourth, posting high quality content on your website will increase your organic search engine reach, particularly if consumers spend time reading the articles, sharing the articles, and clicking on internal links. Keep in mind, Google and other search engines are giving websites that publish high quality content higher organic rankings! Finally, the relative cost of using FaceBook to distribute and promote your content is very low, considering the potential return on the investment that you will gain by actively promoting your brand to consumers in your area. If you would like to learn how RDMS can help you with your content and FaceBook marketing strategy, call 613-561-3563 or use the form below. Top 4 Goals Of Content Marketing! Many disaster restoration contractors set up blogs and wonder why they do not work. The purpose of this article is two-fold. First, it highlights the top 4 strategic goals of content marketing. Second, it explains why “content is king” but “consistency is queen.” Consistency is the key to success! In a previous article, I explained why content marketing works and provided you with 7 amazing statistics on the impact that it could have on your business. Ultimately, the implementation or tactical phase of your strategy is the most important. Unfortunately, many contractors I have spoken with understand the strategy, but fail to properly launch and maintain it. 1. Begin building relationships with potential clients early in the sales cycle. This is accomplished by offering helpful information on your website using your blog and creating awareness of your articles through distribution on social media. 2. Establish trust and expertise in your service area. You want to position yourself as the go to resource for consumers searching for information on mold, water damage, fire damage, etc. 3. Increase your organic SEO potential. If you consistently update your website with content and bring visitors to your website through your online promotion efforts, this will lead to consistent organic search engine visibility which will increase exponentially over time. This part of the lead generation equation leads to long term ROI from efforts and why I advise you to think of digital marketing as an investment into a stock. The goal of this strategy is to create leads that turn into sales. 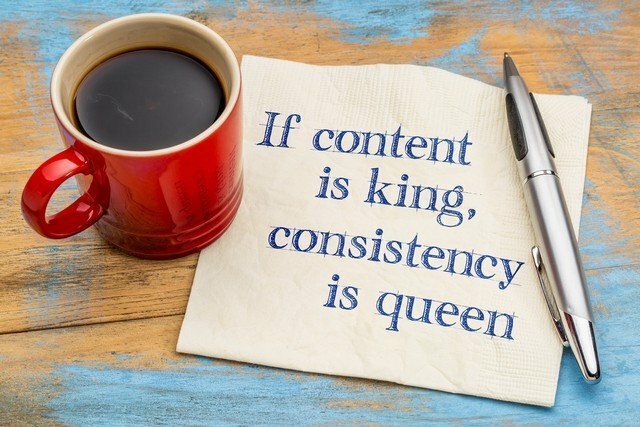 Content Marketing Is King, Consistency Is Queen! You likely have heard that “content is king”. It is quite the buzz phrase and truly is one of the most effective strategies that any business can implement. A word of caution. “Content is king” only if it is sincere, meaning it must provide real value to the reader. For a website to generate positive and higher listings on Google the content must not be “thin” meaning when you post a blog on your website, aim for at least 1,000 words or more. Most importantly, the content you post on your website should answer a question or address a common concern that you are often contacted about by prospective customers. The easiest way to create a list of topics to write about is to list 50 questions that customers ask. Once you create your list of questions you now have a list of topics that you should begin writing about. The focus should be on producing quality content. It should not be too sales oriented. I know, it sounds counter intuitive but keep in mind you are trying to build a digital relationship of trust with your reader. Be sincere and honest. Don’t post an article for the sake of getting an article up. In addition, make sure that you implement videos, pictures, infographics, when appropriate to do so. If content is king, then consistency is queen because this strategy is only effective if you set a posting and promoting schedule and stick with it. 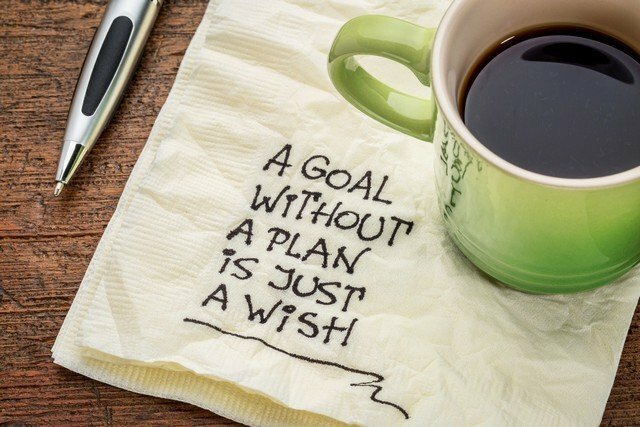 You need to commit to the strategy by planning and executing. During site audits, I often find that many well intentioned contractors start a blog. In the beginning, they are posting consistently, and then as they get busy, stop. This pretty much negates past efforts. The only way to succeed at content marketing is to do it consistently. If you don’t have time, delegate the responsibility to business development or marketing personnel or hire a third party to manage your website and ensure that the posting schedule is maintained. Consistency is imperative for one key reason: It builds trust! The only way to build relationships and convert readers of your blog into leads and sales is to demonstrate that you can be trusted to follow through and consistently update your website with high quality content. Blogging is a game changer for the disaster restoration industry. The purpose of blogging is to connect with consumers early on in the sales cycle. Done consistently, this results in relationships, relationships that ultimately lead to trust. Business is built on relationships and the most important factor in a purchasing decision is TRUST! This article explains why digital marketing works by answering the top 5 questions most often asked by disaster restoration contractors. In addition, we list and explain the top 7 statistics that show you why content marketing can be such an effective strategy at increasing your leads and sales. In 2017 one of my clients advised me that he was planning to sell his business and asked if I would be willing to analyze his financial statements. He asked because I was once the CFO of a disaster restoration company and he wanted my opinion on his P/L and Balance Sheet. After carefully reviewing his statements I realized that his business doubled since we began working together. Businesses that blog get 126% more lead growth. Websites with blog content end up with 434% more search engine-indexed pages than other business sites that don’t publish content. In short, content marketing will build long term organic search for your business. Blogging builds trust. In fact, 6 out of 10 consumers make purchases because of blogs and sharing on social media. The purpose of this article is to answer the top 5 questions I encounter from current and prospective clients about digital marketing. In addition, I also list the top 7 statistics on content marketing, the strategy I used to help my client double his sales. 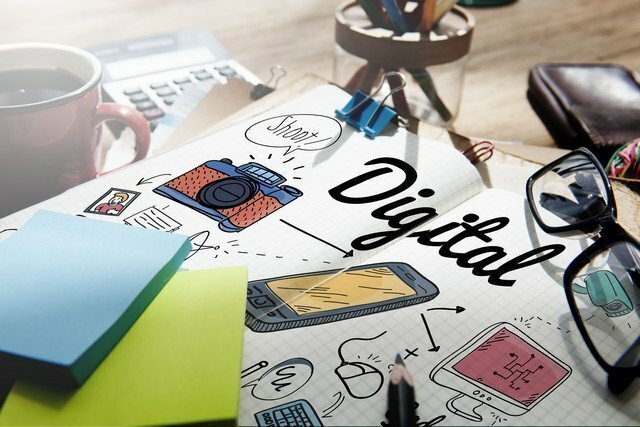 Should I implement a digital marketing strategy? Yes, you should. Many contractors have websites, which is great. But there is no point in having a website if you do not have a proactive strategy to bring visitors to your website. A digital marketing strategy, implemented correctly, will increase the number of visitors to your website, which will translate into leads. Sales data proves this. Patience, is the key. Which strategy do you recommend the most? I recommend content marketing, sometimes referred to as inbound marketing. Statistically speaking, content marketing is the strategy you need to invest in today to stay competitive. Small businesses that blog get 126% more lead growth than small businesses that do not blog. A whopping 77% of internet users read blogs. Combine that stat with the fact that small businesses with blogs see more lead growth. Content marketing rakes in conversion rates six times higher than traditional marketing for converting people into leads and leads into customers. Content marketing may require more time, patience, and effort over the long haul, but the rewards are far greater. Content marketing is the present and future of marketing. It’s efficient, compelling, and subtly persuasive. It also can be less expensive. Best of all, it works, as these statistics prove beyond a doubt. Of course, like any strategy, content marketing requires skill, persistence, and consistency to work. This is perhaps the No. 1 secret to getting results like those outlined. You have to work for it. But, it is worth the investment. 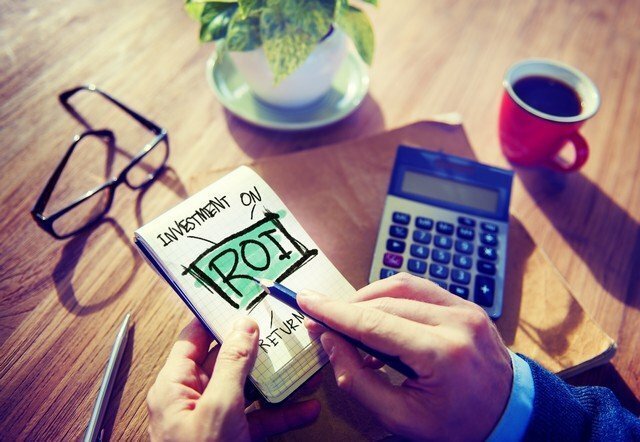 The ROI multiplies over time because this is a long term strategy. Think of your investment as a stock investment whose value grows over time. Do you have data to back up results from this strategy? Up until now, the only data I could back up was anecdotal based on more than 7 years of experience marketing in this industry. Today, I have data to back this up which I present in the free digital marketing course I am offering. The purpose of this e-mail course is to share with you how I helped one of my clients double their sales in 24 months with the content marketing strategy I implemented for him. This course provides you with sales and other statistical data to demonstrate that if you honestly commit to the strategy I recommend, then you will gain tangible results. In addition, this course also provides you with the tactics and implementation plan. To learn more about the course and sign up for FREE, click here. After explaining my strategy, which is focused on educating consumers in the market, he told me he would work with me. The results speak for themself. In 2016, total page views to his site were about 21,000. In 2017, page views increased 50% to about 31,000. 2018 traffic is up 35%. Most importantly, this client is getting leads which are converting into sales. He has positioned his company as the expert in his market because of the high quality content that is posted on his website. The distribution strategy we use increases brand awareness and traffic. The Purpose Of Blogging Is To Build TRUST! The purpose of blogging is to connect with consumers early on in the sales cycle. Done consistently, this results in relationships, relationships that ultimately lead to trust. In the highly competitive world of disaster restoration, what is the differentiating factor? If a potential customer gets estimates from three companies for say mold removal, how will the customer decide who to work with? Price and experience are very important. But the most important factor in the decision is whether or not the customer TRUSTS you. Business is built on relationships and the most important factor in a purchasing decision is TRUST! You create trust in your brand by creating awareness and investing in providing high quality information that educates consumers in your area. In fact, in many cases, my clients charge more than their competitors for their services and still close the sale because of the trust and relationship they built with content on their website. Maximize Digital Word Of Mouth And Get More Leads! We are living in a social world, meaning you need to proactively promote your brand on FaceBook, Twitter, Google+, and LinkedIn. Think of it this way, if you post a really informative article on your blog and share the link on your FaceBook page and the information resonates with consumers in your area, they will share the article. This is FREE advertising for your business and brand and will lead to that many more visitors that can convert into leads and sales. 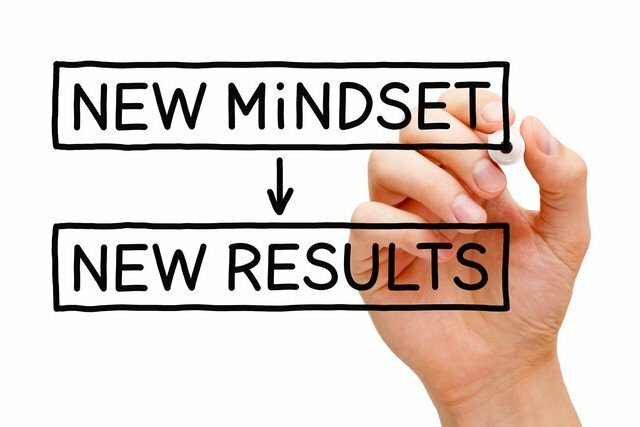 Change Your Mindset and Get Better Results! I have a passion for the industry because I truly believe that restoration contractors are providing a critical service to people who are usually dealing with very stressful circumstances: flooded home, fire damage, mold, asbestos, etc. The disaster restoration industry is competitive. There are many large franchisors who get most of the insurance work. Independent restoration contractors need to learn how to market and get leads on a smaller budget. Blogging is the answer! Independent contractors personify “guerilla marketers”. They need to maximize the return on their marketing dollars. Contractors that get a higher ROI usually are Out Of The Box Thinkers that realize that traditional marketing (flyers, radio, print, etc) has some value but digital marketing can help them stand out from the crowd. Blogging is a game changer for the disaster restoration industry, particularly for independent contractors that are competing with large franchisors and want to gain greater market share. As part of my education commitment to disaster restoration contractors in North America, I am offering a free restoration marketing course that will teach you how to implement a successful digital marketing strategy. You can use this plan within your organization to determine your strategy. Most importantly, the course provides you with a step by step implementation plan. In addition, if you provide us with your website url, we will provide you with a complimentary SEO and website audit report so that you can fix any potential problems you have with your site. Learn How To Increase Your Leads And Sales By Implementing A Digital Marketing Strategy! Sign Up For Our FREE Digital Marketing Course! Answers to the top 5 questions most contractors have about digital marketing. 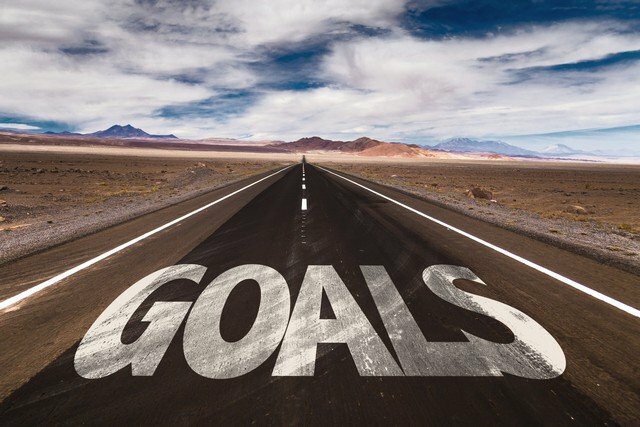 Understand what the top 4 digital marketing goals are. Knowledge about FaceBook’s marketing benefits, backed by stats. ROI to expect from a digital marketing campaign. 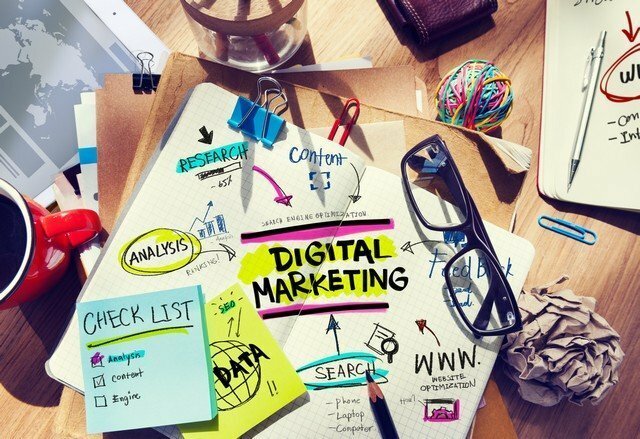 Top 10 skills required to manage and implement a successful digital marketing campaign. How to implement and track your digital marketing campaign. The top 3 keys to success. The course is delivered via e-mail so that you can access the lessons easily from your inbox. Sign up for the course below. The inspiration for this course resulted from a discussion I had with one of my clients that I began working with in the summer of 2015. In the fall of 2017, he told me that his sales doubled in 24 months and attributed much of the sales growth to the digital marketing strategy I implemented for him. Based on his feedback, I started writing a blog article in December, 2017. Over the past couple of months, what I intended to be just a 1,000 word article, has evolved into a digital marketing course. For a limited time, I am offering this digital marketing course for FREE. The course is divided up into 8 lessons and provides you with details on the strategy and the tactics I used to help my client double his sales. Included in this course are sales statistics, advertising spend statistics, and other data to help you understand the benefits of digital marketing. You will have answers to the top 5 questions most contractors have about digital marketing. You will understand what the top 4 goals are of a digital marketing strategy. You will gain knowledge about the benefits of using FaceBook. You will learn what ROI to expect from a digital marketing campaign. You will learn what skills are required to manage and implement a successful digital marketing campaign. You will learn how to implement and track a successful digital marketing campaign. 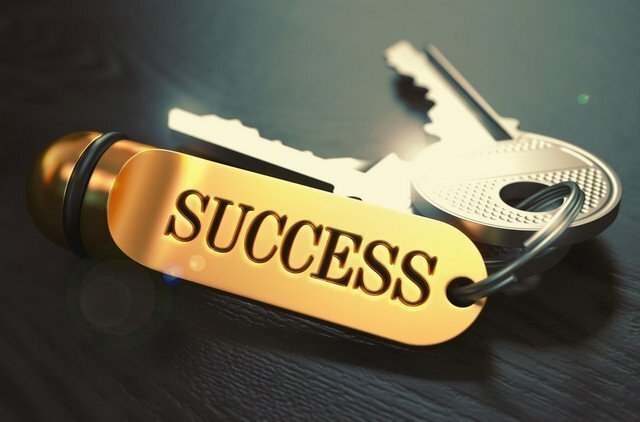 You will learn what are the top 3 keys to success. The course is delivered via e-mail so that you can access the lessons easily from your inbox. Sign up for the course below. Once you sign up you will need to confirm your e-mail address. Once confirmed, the first lesson will be delivered within 24 hours. A new lesson is delivered every 3 days. The Business Case For Disaster Restoration Contractors To Implement A Digital Marketing Strategy! 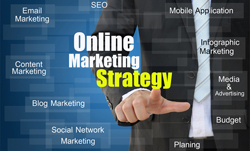 Do You Have A Digital Marketing Strategy? • Become a comprehensive resource of information for consumers and businesses seeking answers to their questions. Digital marketing has permanently changed the landscape of marketing and early adopters will benefit. The long term purpose of digital marketing is to connect with consumers in a meaningful way. This can be accomplished through a comprehensive and consistent content marketing campaign promoted through social media. Business success is based on establishing relationships. Consistent content that consumers want to share builds TRUST ultimately translating into long term sales. Compared to traditional brand building advertising (newspaper and magazine ads, television, radio, etc.) where the investment must continue in order to generate an ROI, content marketing provides a much higher potential long term ROI. As content is added to the website, the pages are indexed by Google and other search engines, increasing the opportunities for higher ORGANIC listings from the search engine optimization (SEO) efforts. Over time, as more pages are added, this creates long term ROI because more pages can be accessed by consumers searching for services offered by your company. In short, digital marketing generates a much higher ROI than traditional advertising because the content becomes a permanent part of the website, thus creating long term value from consumers that find the content through queries on search engines. According to Jay Conrad Levinson, author of Guerrilla Marketing for the New Millennium and Seth Godin, author of Permission Marketing: Turning Strangers into Friends and Friends into Customers, business success depends on your ability to gain permission to market. Permission marketing is less costly and more effective than traditional interruption marketing. Interruption marketing has become less effective because consumers are constantly bombarded with commercial messages. Unread junk mail and flyers end up in the garbage. Constant bombardment through television, radio, billboards, magazines, direct mail, telemarketing, and newspapers make us unconsciously filter out the message. Conversely, potential customers pay attention to permission marketing messages because they invited us to send them. This system enables us to spend less time marketing to strangers and more time marketing to friendly prospects that look forward to hearing from us. The message becomes personal and relevant, establishing trust between client and marketer. Prior to the popularity of blogging and social media, smart marketers used the Internet as a tool to build e-mail lists that they consistently permission marketed to. Today, social media has once again changed the landscape of marketing. Intelligent marketers still understand the importance of e-mail marketing, but have also added blogging, promoted through social media, to their marketing arsenals. Content marketing expands the reach of brands, enabling them to leverage the power of word of mouth because social media makes it so easy for consumers to share information. The success of any blogging effort is based on commitment and not just a campaign. The whole premise of blogging/content marketing/inbound marketing is to add value to the reader’s life. This is important for one key reason: it creates relationships and relationship building is a prerequisite to gaining leads which can be converted to sales. Yes, content curation and creation adds costs to any marketing budget, but the long term benefit should be a high ROI simply because excellent and consistent content builds TRUST and TRUST drives REVENUE. The key is that by sharing and creating content, your business will build relationships with many readers and followers. At the same time, consistency and relevancy of content will build trust in the brand which should result in sales for your business. The various social media channels: Twitter, FaceBook, LinkedIn, Pinterest, YouTube, Instagram, Google+, etc. make it that much easier for individuals to share information and pass it on. This is the key to understanding social media. In the words of Jim Carroll, futurist author: “Technology is accelerating the rate of change.” To capitalize on changes in the market place, innovation needs to be a part of your businesses marketing strategies. Blogging, content curation, and content production should be part of any business strategy. Blogging is the equivalent of publishing newsletters that needed to be mailed out to a database of subscribers prior to the dominance of the Internet. It is a way to connect with customers. 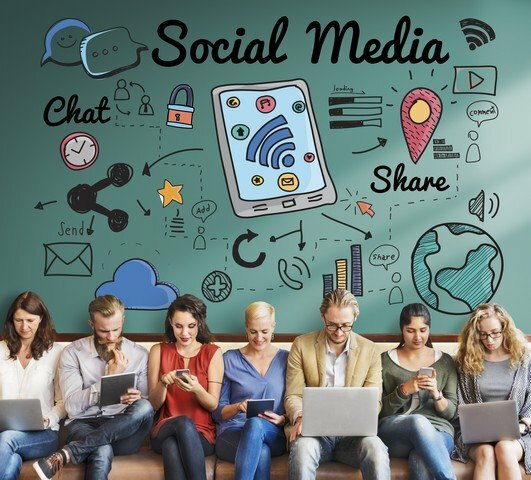 Social media accelerates the ability of a business to connect and get the word out. • In Canada and the United States, 152 million people access their profiles and spend an average of 21 minutes. Boosting excellent content is essential to reaching your target market thereby increasing followers and potential customers. At the same time, it is also a important that your business commits to a Twitter campaign that not only tweets content produced by your company but also relevant content curated from news sources and other experts. • There are 2.1 billion Twitter search engine queries per day. By increasing the number of Twitter followers, your company will increase its overall influence and following, which in turn, should translate into future business. 2. Actively promote the content on social media channels: Twitter, FaceBook, Google+, and LinkedIn and respond to any comments or interaction. 3. Build a following of fans by boosting posts on FaceBook. This is paid advertising that can be tracked and has the added benefit of reaching a targeted market in your state. 4. Build followers on Twitter, LinkedIn, and FaceBook not just through content posted on your company blog, but by researching and searching out content on news sources and other blogs. The above steps will accomplish the objective of attracting followers, and most importantly should create significant social sharing. Social sharing of content is important to higher search engine rankings. There is a strong business case for committing to a digital marketing strategy. The success of such a strategy will be built on excellent content actively shared across multiple social media channels. • Increased lead acquisition and conversions that should generate sales and revenue for your business. If your business is ready to commit to a digital marketing strategy, contact us, we are here to help.